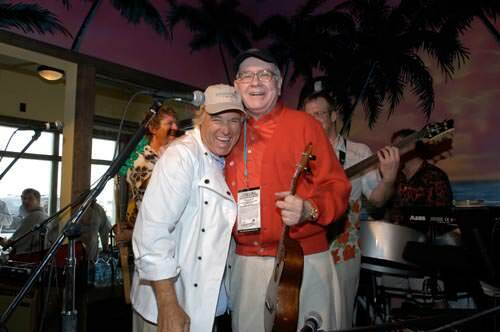 No, Jimmy Buffett and Warren Buffett aren’t relatives, but they are related. Jimmy probably made as much money investing in Berkshire Hathaway years ago as he has playing music. And Warren likes to jam with him. But where they are even more related is how they live their lives. You guessed it—in crescendo. Why stop doing something and “retire” when you’re having so much fun? No way! 1. To withdraw, as for rest or seclusion. 3. To withdraw from one’s occupation, business, or office; stop working. 5. To move back or away; recede. Still want to retire? If you were told you had only six-months to live, and you would be in perfect health, what would you do? Job retirement, especially with a pension or enough savings, is that golden moment to redirect your energies toward your passions! Forced retirement still means you now have a chance to redirect your work efforts toward other goals. But for heaven’s sake, don’t retire from living your life in crescendo. Howard and his wife Marika are having a ball helping people figure things out if you haven’t already figured out a pathway on your own. The key is to find your crescendo and then live it to the fullest, the sooner the better. If you do find what cranks your engine every day, then retirement won’t be a word that’s found in your vocabulary.